If you are a frequent reader, you are undoubtedly familiar with hacker [Sprite_tm]. He has been working with fellow members of the TkkrLab hackerspace to get things ready for their official grand opening on May 28th, and wrote in to share a project he recently completed to kick things off. As part of their preparations, they have been stocking the joint with all sorts of hacker-friendly goodies including plenty of tools and Club Mate, as well as a vintage ‘1943’ arcade cabinet. The game is a group favorite, though every time the power is turned off, it loses all of the hard-earned high scores. [Sprite_tm] knew he could improve on the current paper-based score register, so he pulled the machine open to see what could be done. He used an AVR to tap into the machine’s Z80 logic board, allowing him to read and write to the entirety of the game’s RAM whenever he pleased. This enabled him to keep tabs on the high scores, restoring them to memory whenever the machine is powered back on. The addition of the AVR also allowed him to add a TCP/IP interface, which is used to send high scores to Twitter whenever someone beats the previous record. His modular bus tap can be used in all sorts of Z80-based hardware, so if you have some vintage equipment laying around, be sure to swing by his site for a more detailed look at the build process. For a minute then I read that as ‘a vintage arcade machine from 1943’!!! Duhhh! I love video game hacks – this rules. And tweeting high scores is actually really cool. Great jorb! I like that you can send messages to the machine that are displayed in the game. Much better than just sending scores to twitter, which makes sense, but seems like an underutilisation of the hardware. Sounds like something to play with BUT it’s above my skill level. I have a RASTAN and P.O.W Jamma boards that have Z80’s on them. 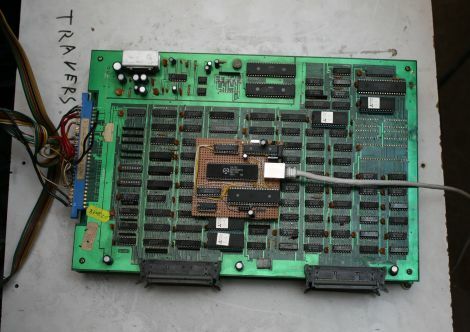 Oh wow, this is something I wanted to look into for NEO-GEO arcade hardware. I’ll definitely have to check this out! just sending scores to twitter, which makes sense, but seems like an underutilisation of the hardware. For Neo-Geo you would need a different version of the hardware that was compatible with the 68000 used on the Neo-Geo board. Taking over the memory buses should be pretty easy I think.. but the Z80 and 68k have their own buses from what I remember, so if you want to mess with both you would need a fair bit of hardware. The Z80s databus is only used for audio data IIRC.. so you can probably ignore it. Taking over the 68k memory bus should be fairly easy. If you can take over control of DTACK the bus is basically yours. You just have to make sure you don’t break some other timing that other parts of the system rely on. The 68k’s I’m building a machine with at the moment are fully static, so I can stop the clock and restart it. I’m not sure if that is the case with the original 68000 used in the NeoGeo. The Ethersex thing he is using looks interesting but all the docs are in German from what I can tell. Is there anything in English? Also.. there is no reason why you can’t load your own code onto the 68k to play with the Neo’s NVRAM where it keeps the bookkeeping stuff (on the MVS at least). IIRC the unibios has a hack that does this and communicates over the 2up controls/second pad connector. Wait!?!? A 1943 arcade cabinet?!?! I JUST saw one of those here in my town. Makes me wonder if they were just down the street from my house(literally, less than a block is a guy who has a ton of near-mint game machines).